As a soon-to-be parent, one of the much-needed items that will surely appear on your baby registry is a baby monitor. Although diapers, onesies, and formula are necessities, a baby monitor is also a wonderfully nice-to-have tool to help you keep an eye and ear on the baby; ensuring he/she is sleeping safely and soundly. With so many baby monitors on the market, with unique features and functionalities, it will certainly be a tough decision to choose just one. Some factors to consider as you are researching baby monitors is price, technology features, and your individual needs. As you’re creating your baby registry, consider the Hello Baby brand. 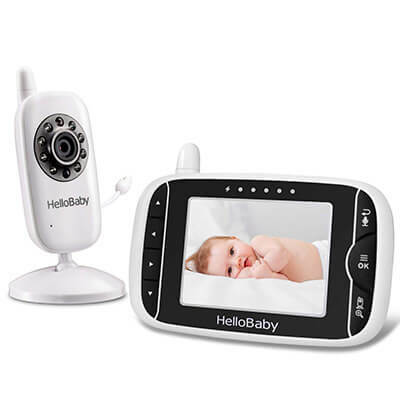 Hello Baby offers affordable and feature-packed baby monitors for overseeing your baby up to 960 feet away, a component that comes standard on all models. Out of the box, Hello Baby comes with two devices, a baby unit and a parent unit. 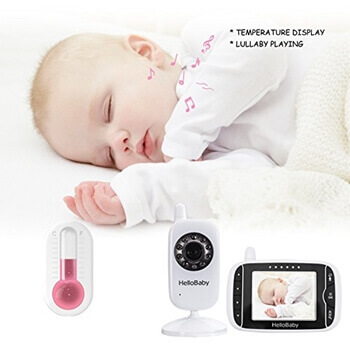 The Hello Baby Monitor allows you to determine the temperature of your baby’s room, listen for cries and gives a clear view of the nursery/child’s room via the wireless, hand-held parent monitor. Although there are several models available, they all have basically the same functionality and features included; it’s the size of the screen that varies. One of the benefits of this product includes the easy-to-use wireless parent monitor, where many of the features are controlled with the touch of a button. To get you started, here is some useful information about the practical features of the well-reviewed baby monitors from Hello Baby. Hopefully, this will help narrow down which model may be right for you! Quality of Video – The video quality of this monitor is high-resolution – full color and clear. Plus, it includes a black and white night vision feature as well as a 2x zoom feature. Security and Safety – This device has a 100% private connection and 2.4GHz wireless technology to prevent signal drop out. Plug and Play – The baby monitors are easy to set up and connect. Simply plug the baby monitor into the wall (this unit should be plugged in always) and charge the parent unit. One parent unit can also be connected to 4 baby monitors, letting you oversee multiple rooms at a time. Battery Life – You’ll be able to monitor the battery life of the parent model by a charge indicator, so you’ll know when to re-charge the wireless device. This device stays alive for 8 hours with the screen on or 12 hours in the power-saving mode. Temperature Gauge – The parent monitor allows you to gauge the temperature (either Celsius or Fahrenheit) in the baby’s room, letting you know if your baby is comfortable. Two-Way Microphone – The Hello Baby monitor features a microphone on each device so you can both hear your child and speak to him/her. Also, a row of LED lights alerts you to the volume of your baby’s voice, letting you know if he/she is crying. Energy-Efficient – There is an automatic ECO mode setting that kicks in when there’s no disturbance in baby’s room, saving battery life. Connection Disruption Alert – Should the parent monitor disconnect from the baby monitor, an alert will sound to notify you of signal interruption, giving you peace of mind that you are always monitoring your baby. Added Features – You can control cool features like playing 8 different lullabies for the baby to hear or setting an alarm for yourself to wake up (for nighttime feeding/changing/sleeping schedules). 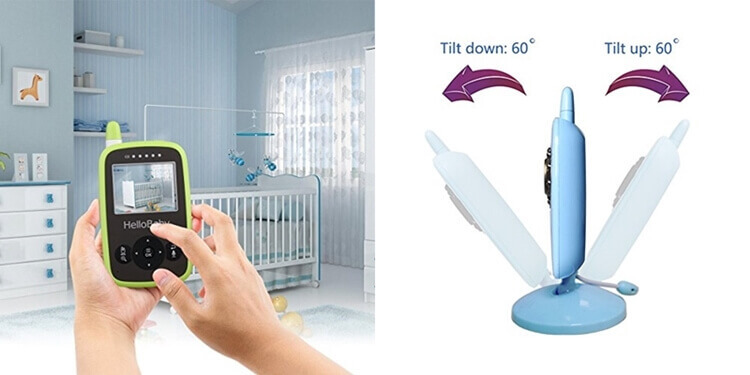 Plus, the baby monitor rotates 360-degrees and up/down at 120-degrees to get the best angle of your child’s room. Colors – this monitor comes in black & white or black & green versions. Models – there are two different-sized models available, one with a 4-inch digital screen and one with a 3.2-inch LCD screen. Even though the Hello Baby Monitor is ready to use right out of the box and is intuitive, sometimes it’s nice to see a product demonstration. 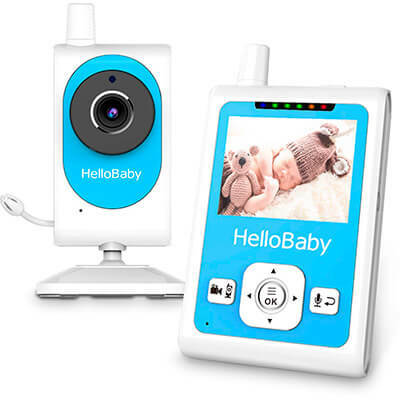 Watch a detailed demonstration of the Hello Baby Monitor below, where you’ll be guided “how to” use the device by a parent and even get a “live” demo of sounds from the two-way microphone! The Hello Baby brand monitors provide a super clear sound and video, allowing you to keep an eye and ear on the baby, even when you are in another room in the house. With all the functionality and features that come standard with this system, it’s quite affordable. The different models of the Hello Baby Monitor are priced below $100 on Amazon.com, and some have over 900 reviews. A limited warranty is typically included with the Hello Baby monitors as well. 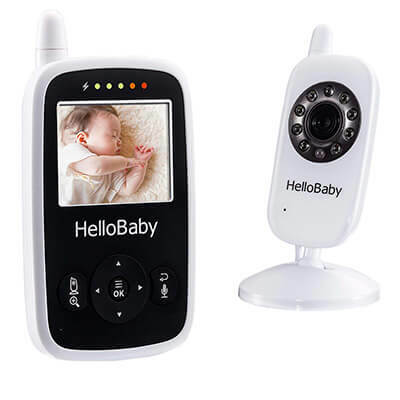 So, regardless of which baby monitor you choose, based on price, needs and preference, know that the Hello Baby Monitor is an excellent choice to consider while waiting for baby to arrive!